CacheManager for EPiServer CMS 7 Now Live! 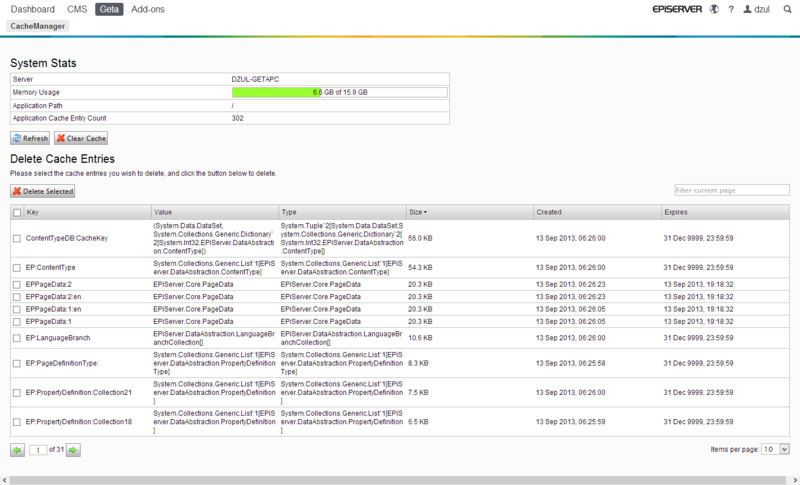 Geta has just released an updated version of CacheManager for EPiServer CMS 7. It has been rebuilt from scratch to take advantage of ASP.NET MVC, now fully supported by EPiServer CMS. One-click cache clear - Clear EPiServer site cache with just one click. Selective cache entry deletion – Select and delete individual cache entries. Cache entry value display – View a string representation of cache entries. Add http://nuget.episerver.com/feed/packages.svc as a NuGet package source. Install CacheManager for EPiServer via NuGet. Start managing your EPiServer site cache. Thanks to Valdis Iljuconoks for helping out with this release.